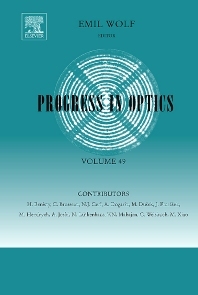 In the thirty-seven years that have gone by since the first volume of Progress in Optics was published, optics has become one of the most dynamic fields of science. At the time of inception of this series, the first lasers were only just becoming operational, holography was in its infancy, subjects such as fiber optics, integrated optics and optoelectronics did not exist and quantum optics was the domain of only a few physicists. The term photonics had not yet been coined. Today these fields are flourishing and have become areas of specialisation for many science and engineering students and numerous research workers and engineers throughout the world. Some of the advances in these fields have been recognized by awarding Nobel prizes to seven physicists in the last twenty years. The volumes in this series which have appeared up to now contain nearly 190 review articles by distinguished research workers, which have become permanent records for many important developments. They have helped optical scientists and optical engineers to stay abreast of their fields. There is no sign that developments in optics are slowing down or becoming less interesting.